While considering the significant collective history of the Younkers Tea room and the subsequent fire that destroyed much of it, three themes emerged for the artist Kathranne Knight: impermanence, memory, and transformation. 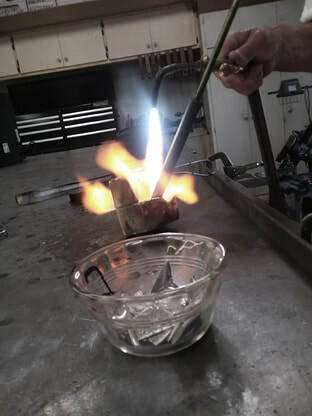 Knight obtains an equivalency of loss and renewal by melting down her sterling silver baby spoon and other personally meaningful objects into a flat form resembling early hand-hammered mirrors. The reflective nature of highly polished silver allows the viewer to glimpse herself, although distorted, in the transformed material of a childhood, and brings up subjects such as nostalgia and identity. The video work titled, “Like Breath on a Mirror,” conjures the anxiety of impermanence by making breath visible as condensation on glass, blurring the maker, slowly dissipating, and reminding us of our own short history. Knight’s work often acts in the packed way of a symbol, stripped down and elemental, but ricocheting with associations and metaphoric possibilities. Subjects such as impermanence, representation, illusion, loss, and landscape, are plumbed through materials as various as fly paper, silver, tears, and graphite. The action and processes of drawing remain at the center of her work and are stretched, performed, and reconfigured. Knight received her MFA from Yale University and has shown widely throughout the United States. She lives and works in Iowa. ​-The artist wishes to thank: Sheena Thomas, Jim Russell and Bruce Bales for their invaluable contributions to these projects.